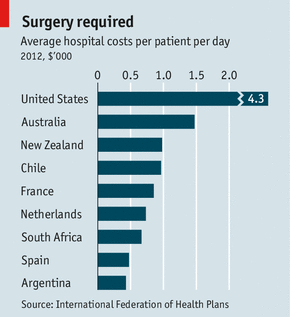 AMERICA’S hospitals are the most expensive part of the world’s most expensive health system. They accounted for $851 billion, or 31%, of American health spending in 2011. If they were a country, they would be the world’s 16th-largest economy. And they are in the midst of dramatic change, much of it due to the “Obamacare” health reforms. The most visible change so far is that big hospital companies are getting bigger. In the latest of a string of recent mergers and takeovers, on June 24th Tenet Healthcare said it would buy Vanguard Health Systems for $4.3 billion including debt. The combined group will have 79 hospitals and 157 outpatient clinics. Others are going further, turning the industry’s business model on its head. In Massachusetts, Steward Health Care Systems is trying to drive patients out of its hospitals and into cheaper clinics. The pace of change varies from one hospital group to the next. But beneath the shift is an argument—by politicians, insurers, patients and some investors—that the old business ways of hospitals are untenable. America has more than 5,700 hospitals, with non-profits outnumbering for-profits by nearly three to one. Most of these share a familiar business model: sell as many services as possible at the highest price. This bodes ill for those who pay, whether employers, the government or patients themselves. Doctors receive a fee for each treatment, so there are few financial incentives to keep patients well. And since the health market has the transparency of a concrete bunker—patients usually do not know the price of treatment until after they have received it—American hospital stays are unusually expensive (see chart). It is little wonder that health spending overall accounts for nearly a fifth of GDP. 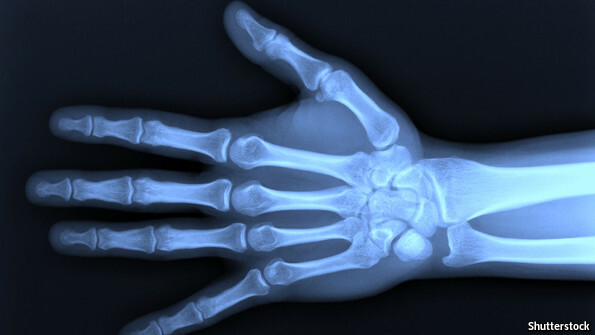 This dysfunctional system will welcome millions of new patients next year. Obamacare requires everyone to have some form of health insurance from 2014. To that end it expands Medicaid, the government’s insurance scheme for the poor, and subsidises private insurance policies which will be offered via new exchanges to be set up in each American state. More people with insurance should mean more patients seeking treatment, so the reforms would seem to herald a golden era for hospitals. Indeed, hospital shares have soared since the Supreme Court upheld the health law’s constitutionality a year ago. Nevertheless, hospitals face mounting pressure to change. In recent years the volume of patients at most hospitals has been flat at best. The recession is partly to blame, since sacked workers lose their insurance. The shifting of some treatments to outpatient clinics has undercut some hospital revenues. And employers have increasingly required their workers to make out-of-pocket contributions towards the cost of their health care, which makes them a bit less likely to seek treatments. Obamacare itself is not all good news for hospitals. It will bring revenue from newly insured patients. But it will also cut the rates the government pays for Medicare, the health scheme for the old. By 2019 these will cancel each other out, reckon analysts at Bank of America Merrill Lynch. And the Medicare cuts already announced may not be the last. The reforms may create fewer new patients than expected: some people may ignore Obamacare’s “mandate” to buy insurance, since the penalties are small. State and federal officials are scrambling to get the exchanges ready in time. Some Republican governors are refusing to expand Medicaid. Obamacare also includes incentives for hospitals to provide quality, rather than quantity, of care for publicly insured patients. Medicare will penalise hospitals that discharge patients only for them to return within 30 days. Groups of doctors and hospitals can apply to be designated as accountable-care organisations, or ACOs, which will be rewarded for keeping the cost of Medicare patients’ treatments below a certain level. (They thus have broadly similar aims to health-maintenance organisations, or HMOs, a type of private health plan that pays a fixed fee to doctors and hospitals for the patient’s care). Last month the Obama administration opened another line of attack on hospital costs by publishing their price lists. These showed huge variations. In practice, insurers negotiate special rates, and these remain mostly hidden. But scrutiny of prices is likely to intensify, as more members of employers’ health schemes are forced to shop around for treatments. The reforms, and the other pressures on the hospitals, have prompted them to launch a big efficiency drive. The well-respected Cleveland Clinic is offering shared medical appointments: a doctor tells several patients how to manage diabetes, rather than counselling them individually. Robert Kaplan and his colleagues at Harvard Business School are helping hospitals measure their costs. Many do a poor job of recording how much each type of treatment costs them in terms of doctors’ and nurses’ time, materials consumed and so on. Hospitals are also seeking economies through dealmaking. All sorts of combinations are being seen, says Martin Arrick of Standard & Poor’s, a credit-rating agency: big, stockmarket-listed chains like Tenet and Vanguard are merging; Catholic hospitals are getting ecumenical with non-Catholic ones; and non-profit outfits are partnering with for-profits. There were more than 200 such deals in 2011-12, according to Irving Levin Associates, a research firm. This does not include many purchases by hospitals of doctors’ clinics. The combined Tenet and Vanguard will have hospitals and clinics across 16 states. This will make it easier to standardise clinical practice, get discounted supplies and make the most of investment in new medical technology. Most important, a bigger firm will have more clout in negotiating prices with health insurers. The most seismic shift, however, is the move away from the fee-for-service model. How can a hospital profit from delivering fewer services, when it is organised to deliver more? HCA, a quoted company with 156 hospitals in 20 states, is all but ignoring the question. Vanguard is one of few listed chains to have started looking for answers, including taking part in ACOs. Steward, which is only three years old, seems to be the most ambitious in embracing change. It was created when Cerberus, a private-equity firm, bought a struggling chain of Catholic hospitals in 2010. Steward does not aspire to have the best hospitals in America—indeed it sends its most complex cases to a rival medical centre in Boston. What it wants to offer is good, convenient, reasonably priced care. Steward has signed up as a Medicare ACO and also has contracts with private insurers that reward it for keeping patients well as opposed to paying it by quantity of treatments. The company has 11 hospitals, up from six in 2010, and a network of 2,900 affiliated doctors, up from 1,100. Steward is making efforts to ensure that patients do not suffer expensive relapses: nurses scroll through records to confirm that patients have collected their prescriptions and had their check-ups; more home visits are being made to recently discharged inpatients. But it is unclear overall whether such efforts will boost profits, or indeed lower America’s health spending, let alone both. Large hospital chains, thanks to their clout with insurers, are more likely to raise prices than cut them. Steward’s prices are lower than Massachusetts’s most expensive hospitals, but higher than those of some competitors. As for ACOs, they have had a good start: more than 250 have been formed so far. But their success is difficult to predict. ACOs are responsible for the costs of a given set of patients, but those patients can seek treatments outside the group of providers that form the ACO. This may make it hard to contain their costs. George Clairmont, who leads a doctors’ group that partners with Steward, is excited by the prospect of a new era. “We are part of a major change in health care that we haven’t seen since the beginning of the 20th century.” But like a novel treatment for a chronic ailment, the cure for America’s bloated hospital industry will need careful monitoring for side-effects. The Bureau of Labor Statistics reports the median annual wage for a registered nurse was $64,690 in 2010. The best-paid 10 percent of RNs made approximately $95,130, while the bottom 10 percent made approximately $44,190. The highest wages are reserved for personal care nurses, or those working for private-sector pharmaceutical or medical device manufacturers. By location, the highest-paid positions are clustered in the metropolitan areas of northern California, including municipalities in and around San Jose, Oakland, and San Francisco. Registered nurses make an average salary of $64,690, which is pretty good pay compared with some of the other Healthcare Jobs on this year's list of The Best Jobs of 2012. That's comparable to the pay of occupational and physical therapists. Medical assistants take home far less money in a year—approximately $35,830 less in 2010 than the average RN earned that same year. And with an average salary that's a little more than $30,000 per year, paramedics also have a lower average salary than nurses. The highest paid in the registered nurse profession work in the metropolitan areas of San Jose, Calif., Oakland, Calif., and San Francisco. The Salinas, Calif. area also pays well, as does the city of Napa, Calif.. The annual median wage of a registered nurse working in San Jose, Calif. is $116,150, which is $51,460 more than the average pay in the profession. » See Registered Nurse Jobs in San Jose, Calif. The annual median wage of a registered nurse working in Oakland, Calif. is $100,900, which is $36,210 more than the average pay in the profession. » See Registered Nurse Jobs in Oakland, Calif. The annual median wage of a registered nurse working in San Francisco is $97,600, which is $32,910 more than the average pay in the profession. The annual median wage of a registered nurse working in Salinas, Calif. is $97,450, which is $32,760 more than the average pay in the profession. » See Registered Nurse Jobs in Salinas, Calif. The annual median wage of a registered nurse working in Napa, Calif. is $97,090, which is $32,400 more than the average pay in the profession. » See Registered Nurse Jobs in Napa, Calif.